Audiofly AF100W review | What Hi-Fi? Audiofly is an Australian headphone specialist that has gradually worked its way into the UK market over the past five years or so. The Audiofly AF100Ws are the first pair of the company’s wireless earphones we’ve reviewed. At £110, they’re a little more affordable than alternatives from Beats or Sennheiser. The AF100W’s earpieces look like those of higher-end earphones. With large plastic enclosures and cabling designed to trail over the ear, rather than hanging straight down from it, they could almost be cousins of the Shure SE425s. A flexible part by the earpiece can be molded to form a hook, to suit the shape of your ear. Unsurprisingly, the earpieces themselves are just like those of the wired AF100s. This sort of fit won’t appeal to all, but it is secure. Audiofly includes a wide selection of tips. As well as standard silicone pairs, a set of Comply foam tips and an array of triple-flanged tips are included. The AF100Ws’ implementation of wireless tech is less fleshed-out, though. 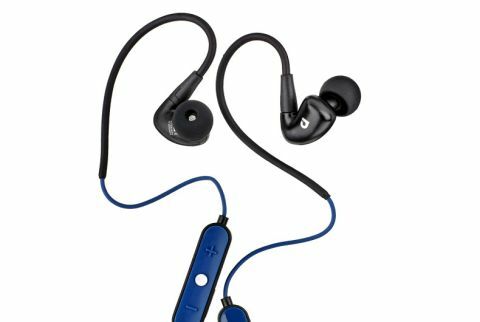 Rather than using a neckband, these earphones have a skimpy cable and a pair of chunky plastic boxes, home to the controls, the battery and the additional electronics needed in a Bluetooth pair. While these boxes aren’t heavy, this design seems clunky and unattractive. When the cable is pulled taut using the built-in fastener, the three-button remote isn’t in a particularly handy place. If it isn’t taut, there’s a lot of spare cable flapping around. A normal neckband pair is more practical for real-world use. Battery life is also fairly poor at five hours, when most neckband pairs tend to last more like eight. They are IPX4 certified for water resistance, though, and have a rubbery flap over the microUSB charge socket. This means the Audiofly AF100Ws can handle water splashes, but not being submerged. They will handle the sweat of a workout, no problem. Even the case is water-resistant, an otherwise basic semi-hard pouch that holds the headphones and charge cable. The AF100Ws use a dual-membrane micro-driver with some sweet-sounding characteristics - but there are several issues. Their character is warm, with a real analogue flavour compared with some other pairs in this class. The timbre is distinctly and pleasingly rounded. There is a good sense of space, and the warmth doesn’t extend flare-like to the bass to ruin its rhythmic precision. However, the Audiofly AF100Ws aren’t clear or coherent enough to compete with the best. Excess mid-bass and a lack of transparency in the midrange makes more complicated arrangements seem confused or muddled. Separation needs to be better. While some real consideration is put into making the surface-level presentation sound grown-up - sophisticated, even - there are deeper issues. The treble also seems closed in, lacking the higher-end spark that adds more energy to sound. The Audiofly AF100Ws have a certain natural tone that has a real appeal. It’s warm and full-bodied. But it’s undermined by a lack of mid-range transparency and treble bit - the Audioflys aren’t the full package. The unusual approach to wireless headphone design is questionable too, resulting in fairly short battery life without any major comfort benefits. We can't wait to hear a pair that addresses these issue while retaining that analogue tonality. They will be real contenders.